Good news! 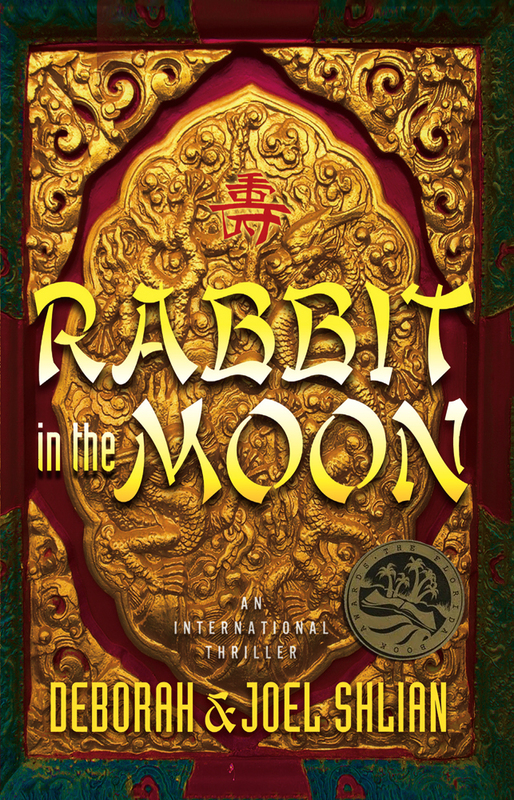 After almost a decade, Florida Book Award Good Medal Winner Rabbit in the Moon is finally released in paperback as an updated Second Edition. Is mankind ready for a scientific breakthrough that could double the average lifespan? Dr. Cheng’s obsession to find the secret puts the doctor, his granddaughter, and the future of the entire world in jeopardy. The backdrop for Rabbit in the Moonis the seven weeks in 1989 between the rise of the Student Democracy Movement and the fall with the Tiananmen massacre in June. We chose this period for two reasons. First, it was dramatic. Anyone who read the newspapers or watched CNN at the time can hardly forget the image of the young man holding up his arm to stop the tank from rolling over him. The second reason for choosing this backdrop was because after our first trip to China in 1980, we returned to Los Angeles and became a host family for students from the mainland who were studying at UCLA. During the weeks leading up to Tiananmen in 1989, many of these students communicated with friends and family back in China using our fax machine. Remember, there were no iPhones or Internet at the time. Very few people in China had their own landlines then. In talking with the students, they perceived the conflict as a generational struggle between the very old leaders, many of whom had marched with Mao and who were desperate to hang onto power, and the younger generation anxious for reforms. We expanded on the generational theme by looking at how young versus old might view the acquisition of a longevity elixir, not only in China, but also in the United States and in Korea. Writing a story with an historical backdrop requires accuracy. It was difficult, however, to know what was happening at the highest level of government at the time. The release of the Tiananmen Papersin 2001- secret documents smuggled out of China- reveal how the authorities reached their decision leading to the final confrontation. In 2008, another secret record dictated onto 30 one-hour audiotapes by the moderate Zhao Ziyang while under house arrest in 2000 (he died under house arrest in 2005), was published by Simon and Schuster. The title is Prisoner of the State: The Secret Journal of Zhao Ziyangand gives Zhao’s dramatic and disapproving account of the bitter power struggle behind the scenes as the students occupied Tiananmen Square, the deep rivalries between reformists and hardliners as well as the critical role Deng played in the decision to use force. Both the Tiananmen Papers and Zeo Ziyang’s memoir formed the basis for assumptions we made in writing the novel. For example, there is a pivotal scene in the book in which three of the leaders meet with Deng Xiaoping, warning that the students threaten his leadership and convincing him to write an editorial for the People’s Daily (which he, in fact, did), accusing the students of creating “turmoil”. Deng’s editorial was really a signal that the hard-liners were in control because it alluded to the “ten years of turmoil” that was the Cultural Revolution. Unfortunately, the students did not appreciate the significance of the message. They did not know that behind the scenes the moderate Zhao Ziyang had been ousted. They began a hunger strike, announcing that they would not leave Tiananmen Square until the editorial was recanted. As a result, any opportunity for defusing the situation disappeared. And as we know, on June 4th, tragically, hundreds, perhaps thousands were killed. Now, 30 years after that bloody suppression, the facts about events that led to the Tiananmen Square tragedy have yet to acknowledged by the Chinese Communist government. After the Tiananmen massacre, the Chinese leaders made a decision that they would tolerate more economic freedom in order to maintain power. In 1992 Deng visited the southern new territories and blessed economic reform with the famous statement “to get rich is glorious” This change was not meant to promote democracy, but rather to maintain central control. And as it happens, for almost two decades there was astounding growth and modernization, though not without creating serious problems including increasing poverty in the countryside, forcing young people from farms to the cities seeking work, elimination of free health care, increased pollution, increasing crime, widespread corruption, etc. As China has begun to face its own domestic financial crisis with rising unemployment, manufacturing decline, and some fear regional ethnic strife, the leadership has received increasing criticism from within the country. In November, 2018 protests on Peking University brought a warning to student activists that protests “bear consequences”. The clampdown at Peking University comes ahead of several politically sensitive 2019 anniversaries, including the May 4 student protests in 1919 and the 1989 Tiananmen Square massacre, in which students from the university played prominent roles. We hope that readers will find this new edition of Rabbit in the Moona compelling and still timely read. In this edition, we took past readers’ advice, so you will find a list of the characters and a glossary of some of the Chinese and Korean terms to avoid confusion. As we wrote in an earlier post, this month marked the 23rd anniversary of what the Chinese government refers to only as “the June 4th incident”. Yet that “event” became a pivotal moment for the nation as leaders made a deal with its citizens: you can get rich (in fact, Deng declared “to get rich is glorious”), but don’t try to bring down One Party Rule. Our recent trip to SE Asia included stops in south China and Hong Kong. With each visit since 1989 we’ve seen extraordinary changes. China has made impressive economic gains: second largest world economy, over 300 million people living middle and upper middle class lives, and almost 100 billionaires. The big cities like Beijing, Shanghai, Guangzhou on the mainland are so modern, it’s hard to find much of old China there. And Hong Kong- well that’s like New York on steroids. What continues, however, is the fear by the government of any kind of rebellion resembling the failed 1989 student movement, or worse, the successes of the recent Arab Spring. Internet censors are constantly checking for key words like “Tiananmen” or “Charter ’08”, the online proclamation that China should embrace democracy which sent Liu Xiabo, winner of the 2110 Nobel Peace Prize to jail for 11 years. Hard to believe 23 years have gone by since the Tiananmen massacre of June 4, 1989. Despite the distance of time, any official discussion of the event the Chinese government still refers to as merely the “June 4th incident” is taboo. While Hong Kong remains surprisingly open in terms of freedom to assemble and protest about that night (there are yearly candlelight vigils on the anniversary of Tiananmen), there were no demonstrations reported across Mainland China where the events of June 4th are still considered “counter-revolutionary”. When the Shanghai Composite Index opened today at 2,246.98, several bloggers within China interpreted this as the 23rd anniversary of the June 4, 1989 crackdown when read from right to left. Their blogs were immediately shut down by censors. The Chinese have a long tradition of being superstitious- especially about numbers. There has been some speculation as to whether the fall in the index represented the work of hackers, but many believe that to be highly unlikely. Liu Weimin, a Chinese Foreign Ministry spokesman, expressed “strong dissatisfaction” with the statement. Despite its acceptance of a more Western style capitalistic approach for its economy, the Chinese government is committed to one party rule at all costs. Liu Xiaobo, the winner of the Nobel Peace prize in 2010 and was involved in the 1989 demonstrations is serving an 11 year sentence for his internet proclamation “Charter ’08” urging China to end its one party rule and embrace democracy. Gung Hay Fat Choy! Happy Chinese Lunar New Year, the longest and most important Chinese festival. It is also the oldest in chronological recorded history, dating from 2600 BC when the Emperor Huang Ti introduced the first cycle of the zodiac. Like the Western calendar, The Chinese Lunar Calendar is a yearly one, with the start of the lunar year being based on the moon’s cycles. Because of this cyclical dating, the beginning of the year can fall anywhere between late January and the middle of February. Lasting 15 days, this year it will begin on January 23 (the first day of the first month in the traditional Chinese calendar) and end with the Lantern Festival on February 9th. A complete cycle takes 60 years and is made up of five cycles of 12 years each. This Lunar year, 4709 is the Year of the Water Dragon. Fifth in the astrological cycle, Dragon Years follow the Rabbit and recur every twelfth year. Anyone born in 1904, 1916, 1928, 1940, 1952, 1964, 1976, 1988, 2000 or 2012 is born under the sign of the Dragon. According to the Chinese, anyone born under the Dragon Sign tends to be a free sprit- innovative, passionate, enterprising, flexible, self-assured, conceited, tactless, quick-tempered and brave. These personality characteristics are then modified by one of the five Chinese elements of Metal, Water, Wood, Fire and Earth which overlay a 5-year cycle of their own characteristics. For 2012, that element is Water. Water is said to have a calming effect on the Dragon’s fearless temperament. It allows the Dragon to re-direct its passionate enthusiasm, making him or her a little less conceited, perhaps more perceptive of others. Because Water Dragons are also less quick tempered than others born under the Dragon sign, they are better able to take a step back and re-evaluate a situation. As a result, they tend to make intelligent decisions and deal well with others. Still, they need to learn to take their time and complete one project before starting another. 1952 was the last Water Dragon Year and produced such famous people as the leaders of Russia (Putin) and Singapore (Lee), a tennis champion (Connors), innovator (Craig Newmark, the founder of Craig’s list) and a host of CEOs of such companies as Coca Cola, Exxon-Mobil, Alberto-Culver, Time Warner, Colgate-Palmolive, Viacom, UPS, Radio Shack, Clorox, Tiffany & Company, Hershey, ITT, Macy’s, Xerox, and Walgreens. The Dragon is the major symbol of good fortune and intense power in Chinese Astrology. For example, the Dragon constellation is accorded the honor of being the guardian of the Eastern sky. According to tradition, the Dragon brings in the Four Blessings of the East: Wealth, virtue, harmony, and longevity. Therefore people born in Dragon years are to be honored and respected. While the other 12 signs of the Chinese zodiac are earthly animals, the Dragon is a mystical being and therefore special. Sometimes called a karmic sign, it is expected to portend larger than life events (like the dragon itself) for the year. That means spectacular successes as well as crash-and-burn failures. The Dragon is not, however, just about money. It can also bring new love or renew an old romance. So this is a good year for engagements and weddings. Chinese New Year is not only celebrated in Mainland China, Hong Kong, Macau, Tibet or Taiwan. Countries and territories with significant Chinese populations, such as Indonesia, Thailand, Malaysia, Philippines, Singapore, Thailand, Taiwan, as well as in Chinatowns elsewhere. This holiday has even had influence on the lunar new year celebrations of its geographic neighbors, as well as cultures with whom the Chinese have had extensive interaction including Korea (Seolial), Bhutan (Losar), Mongolia (Tasgaan Sar). Vietnam (Tet), and the Japanese prior to 1873 (Oshogatsu). We’ll be heading for some of these places next week to document how Singapore, Vietnam, Cambodia, Thailand, China and Hong Kong celebrate. Stay tuned! Just announced: the Audiobook version of “Rabbit in the Moon” produced by Spoken Word Inc and narrated by nationally honored radio talk show host, Barbara Whitesides, won Honorable Mention at this year’s SF Book Festival. Congrats to them all!! This just adds to the many awards the international thriller has already won including the Gold Medal for the Florida Book Award. Our novel Rabbit in the Moon deals with the Democracy Movement of 1989 when students and ordinary citizens rose up to demand reform. Sadly, that ended in a massacre at Tiananmen Square. Nineteen years later, while there has been much change including a certain economic freedom, the Chinese government is still cracking down on freedom of the press. Below is an online report from CaféSentido.com, a digital imprint of Casavaria Publishing. The Communist party government of China has resumed blocking some websites it had unblocked as a gesture of good will, after foreign reporters complained during the Olympics that certain foreign information sources were not available to them. The BBC and Reporters without Borders (RSF) report their sites being blocked, and the Chinese government says sites that contain information sympathetic to Tibetan or Taiwanese independence movements cannot be allowed to be read in China. President Hu Jintao has, it seems, resumed his “smokeless war” on press freedom, which he announced soon after being named to his office. The campaign of censorship began with the arrest of “dissident” reporters critical of the Chinese state, the mass shutting down of Internet cafés, usually on the grounds of fire or building codes and public safety, and demanding the collaboration of foreign media giants in “filtering” undesirable terms from web searches, like “Tiananmen Square massacre”, “student uprising” and “free Tibet”. Reporters Without Borders condemns the Chinese government’s censorship of the websites of certain foreign news media such as Voice of America and the BBC and certain Chinese media based outside mainland China, which have been rendered inaccessible inside China since the start of December. Among the reasons suspected for the sudden retrenchment of Hu’s efforts to gain total control of Chinese media are events or potential commemorations that could cause unrest in China in 2009. June 2009 will mark the 20th anniversary of the student uprising that ended with the Tiananmen Square massacre, an event the Chinese government still openly aims to erase from Chinese historical consciousness. 2009 will also mark the 50th anniversary of China’s seizing control of all of territorial Tibet. The government may fear that both could lead to civil unrest. But there is also the issue of China’s economic situation. Long the leading light in east Asia’s booming economies, China is now suffering as its main manunfacturing sales markets overseas, the United States and the European Union, suffering deepending economic and credit troubles, undermining business funding, credit for industrial production, and demand for retail conumser goods. There is a rising rate of unemployment and some fear regional ethnic strife and anti-government movements could be inflamed by economic hardship, especially if the impression spreads that the regime is dealing ineffectively with the problems facing the nation. “Rabbit in the Moon” book launch: standing room only!! We had our book launch on Thursday, May 29th at the Borders Bookstore in Boca Raton. As you see from the crowd, it was standing room only! We spoke about how we started writing novels and how we write together. Since the setting for Rabbit in the Moon is the seven weeks in 1989 from the rise of the democracy movement on April 15th to its fall with the Tiananmen massacre, we talked about those events and showed pictures Joel had taken during our travels in the 1980’s. Foot binding, the rendering of young girls immobile by deliberately maiming them, had been part of the Chinese culture since the eighth century. Some time before the age of five, young girls had the heel and toes of each foot pulled together and bound tightly with cloth, until the toes were turned under. Bones that resisted were broken with a wooden mallet, the resultant pain continued for years until the feet became numb. Such torture produced a teetering, swaying gait regarded as a mark of sexual appeal and endured because a girl’s marriage potential and desirability were determined by the size of her feet, not by the beauty of her face. Unable to move, a helpless woman with so-called “golden lilies” would serve her husband and master in any way he desired. Often young girls died from the infection that developed. Even if they survived, the smell from a continuously festering foot would have been terrible. This barbaric tradition was finally banned in 1911 so you can imagine Joel and my surprise when we saw several dozen women outside a building our guide said was a Longevity Institute in Xi’an in 1985. We would have expected only a few such women to be alive with this deformity and certainly not congregated in one place. That “sighting” became part of the impetus for our story. Wouldn’t it be interesting, we thought, if the Chinese were secretly working on aging research here and in fact had, discovered some way to extend the normal life expectancy, all the while keeping it secret? And that’s what we wrote: in our story, Dr. Ni-Fu Cheng has his “subjects’ inside the Longevity Facility, a separate wing of the Xi’an Institute.